Home » Interviews » HOW TO RECRUIT 10 PEOPLE EFFECTIVELY ON SOCIAL MEDIA IN A MONTH. HOW TO RECRUIT 10 PEOPLE EFFECTIVELY ON SOCIAL MEDIA IN A MONTH. How To Recruit People Effectively On Social Media In A Month. Naija Marketing Pro, as usual, invited Engr ‘Dapo Olagunju to her community where we looked at, “How to recruit people effectively on the social media in a month.” Dapo Olagunju, a trained Civil Engineer and have been practicing ever since he graduated and finished his NYSC in 2001 and 2002 respectively. He decided to start studying network marketing and to participate in the industry in 2010. Naija Marketing Pro social media creative director, Olowo Bolarinwa Benjamin sits down with Engr ‘Dapo Olagunju, to talk about, how to recruit 10 people effectively on the social media in a month. 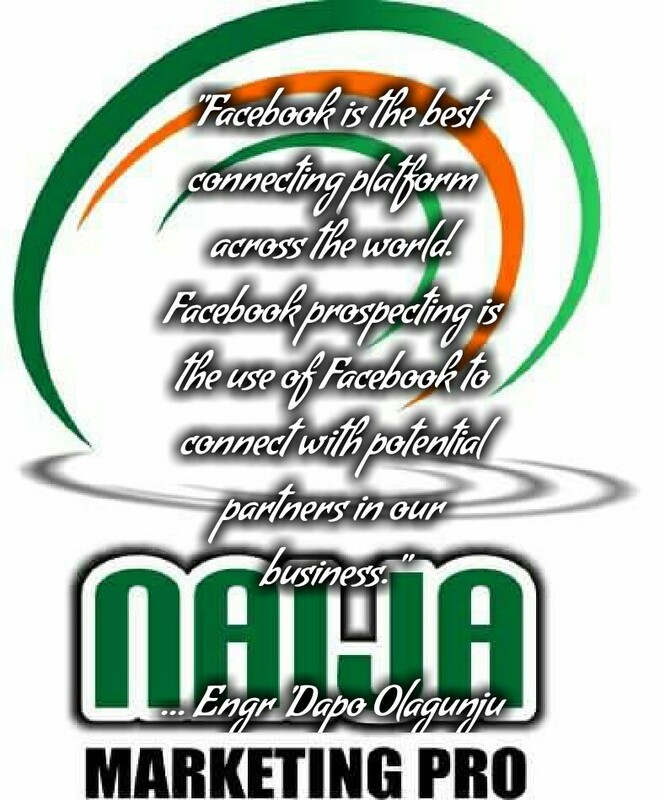 In the interview, Engr ‘Dapo Olagunju, says that, Facebook is the best connecting platform across the world. Facebook prospecting is the use of Facebook to connect with potential partners in our business. Olowo Bolarinwa Benjamin : Good morning sir, I will like to inform you that am not alone here. And we are glad that you accepted our invitation to interview you today. Am currently with our media team. This interview is projected basically to show network marketers most especially youths that are involved in this opportunity how to recruit effectively and build their business, to let them know that they don’t need anyone but themselves to make it in the network marketing industry and also, it’s to let them be aware that they can take full ownership of their lives and teach them specifically since they have made up their minds to be involved in network marketing, how to recruit effectively and how to build an indomitable team. So, can we rock and roll it up together? Olowo Bolarinwa Benjamin : Thank you sir for accepting our invitations. Can you tell us a little about yourself? Engr ‘Dapo Olagunju: My name is ‘Dapo Olagunju, I am a trained Civil Engineer and I have been practicing ever since I graduated and finished my NYSC in 2001 and 2002 respectively. I decided to start studying network marketing and to participate in the industry in 2010. Olowo Bolarinwa Benjamin : Thank you. What to you should be the first thing to be mastered by someone just coming into network marketing, a newbie? Engr ‘Dapo Olagunju: I believe anyone who comes new to the industry should first find out and define what success in the industry means and make that his/her purpose. “when the purpose of a thing is unknown abuse is inevitable : The art of goal setting! 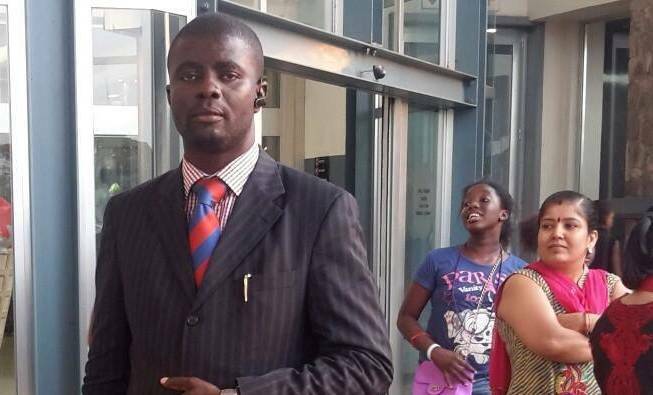 Olowo Bolarinwa Benjamin : Many new people, as they come in, they jump at telling everyone the business opportunity without learning the skills needed and at the long run, they fail and will now be telling others that network marketing doesn’t work, I have seen lots of issues like this, it’s a pity that many people are victims of this. If I may ask, what is facebook prospecting? Engr ‘Dapo Olagunju: Yes, I agree with you that the problem is general globally but amplified in Africa due to the excessive greed and mental laziness tolerated here. Olowo Bolarinwa Benjamin : Hmmm. So, what is facebook prospecting? 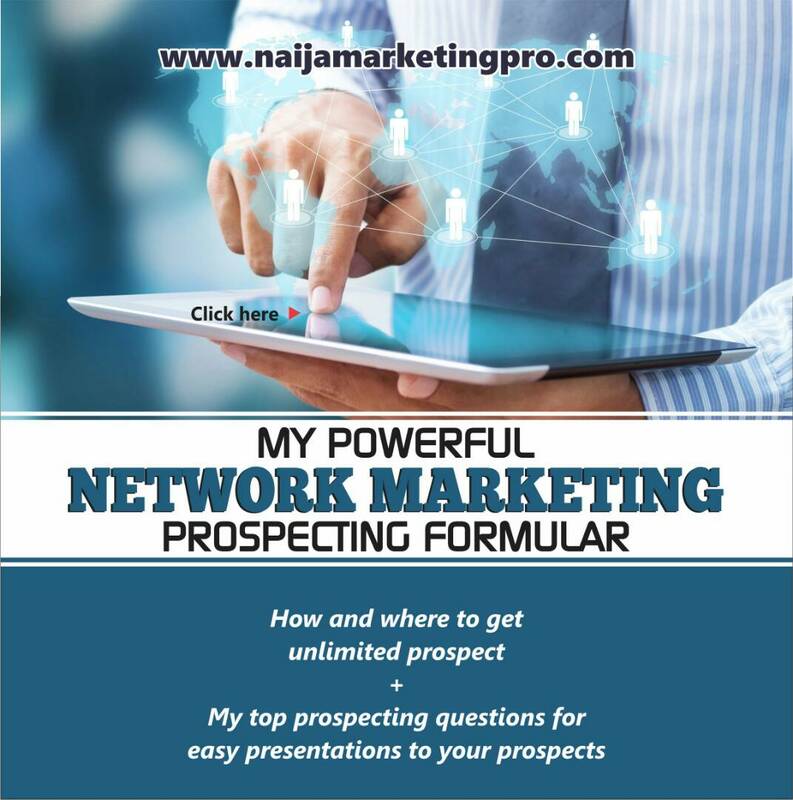 Engr ‘Dapo Olagunju: On facebook prospecting, the major area where people fail in network marketing is in connecting with friends before sharing opportunity. Facebook is the best connecting platform across the world. Facebook prospecting is the use of facebook to connect with potential partners in our business. Olowo Bolarinwa Benjamin : Thank you for this. What is the difference between recruiting and prospecting? 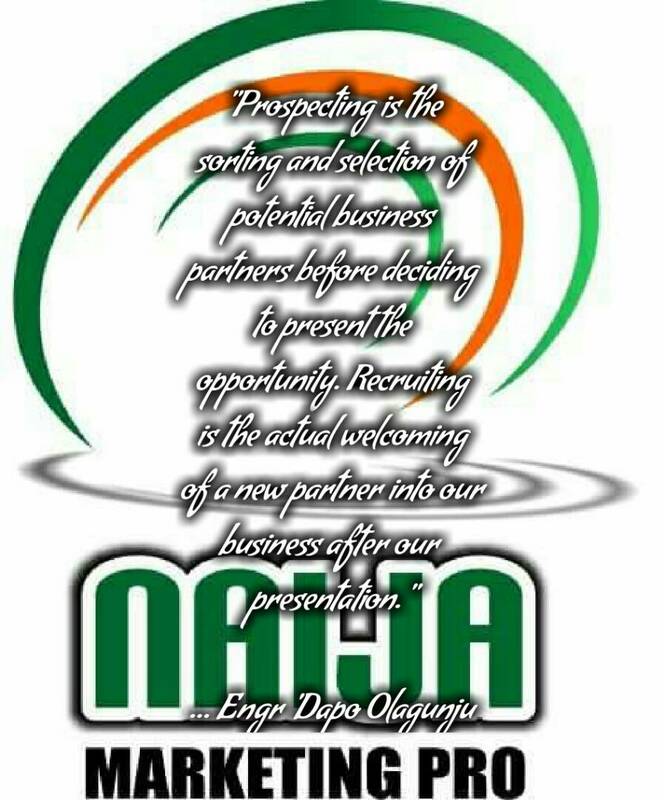 Engr ‘Dapo Olagunju: Prospecting is the sorting and selection of potential business partners before deciding to present the opportunity. Recruiting is the actual welcoming of a new partner into our business after our presentation. Olowo Bolarinwa Benjamin : Wow, but must I prospect everyone or what does it take to have a target market? Engr ‘Dapo Olagunju: You cannot prospect everyone but like minds, also it depends on the product of the organisation we represent. Olowo Bolarinwa Benjamin : Can you please tell me more on this? this then further reinforced the fact that those that you can communicate or connect with alone can work with you as partners in the industry. Olowo Bolarinwa Benjamin : Little wonder Eric Worre says, we are in the business of education and understanding. If I may ask, what is the greatest challenge that you ever faced as a network marketer and how were you able to dealt with it? Engr ‘Dapo Olagunju: The greatest challenge was to be with a company and discovered that the company doesn’t have a product that is fit for network marketing. I had to start all over again with another company since that great company was in search for a product despite very good with education. I mean the first company realized that they had a problem and were looking for solution which I wasn’t ready to wait for. Olowo Bolarinwa Benjamin : So, how were you able to dealt with the fear of starting all over again? Engr ‘Dapo Olagunju: The experience I have gotten and the understanding I gained from many books dealt with such fear. 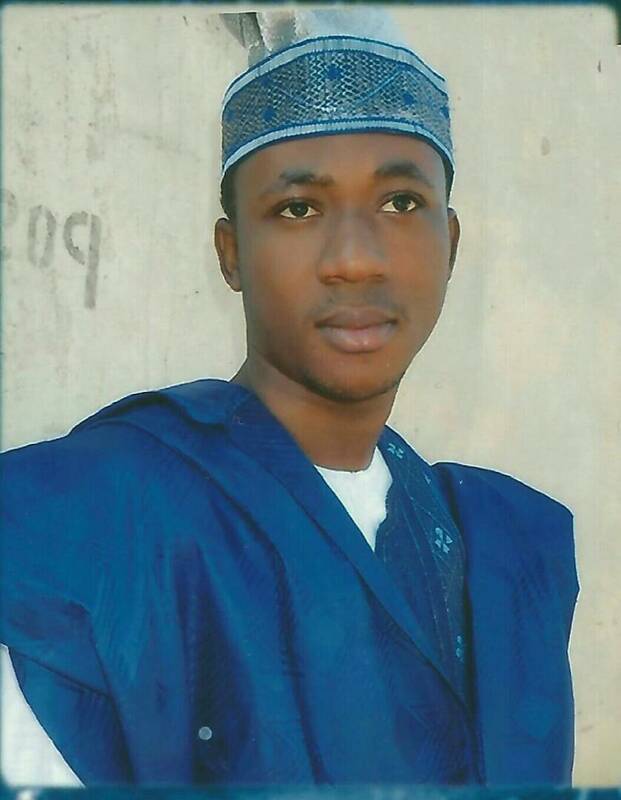 Olowo Bolarinwa Benjamin : In a practical manner, if for example, I am facing same, what and how should I go about it? 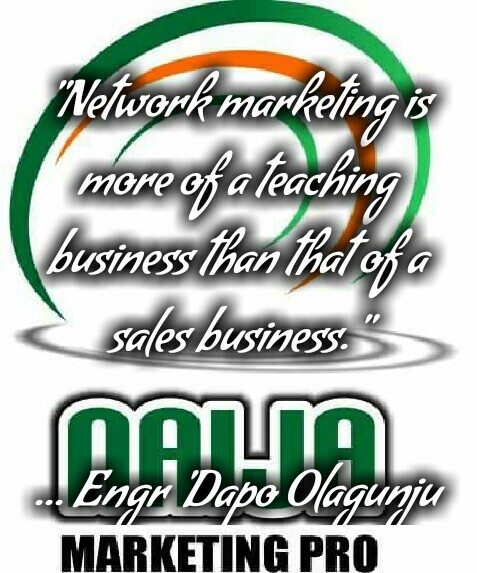 Engr ‘Dapo Olagunju: I believe it should start with knowing the kind of product which can work with network marketing plan of financial freedom. Then search for the product you are comfortable with and the compensation plan to match. Olowo Bolarinwa Benjamin : What are the strategies that has worked for you that I can use to recruit 10 people effectively on the social media on a monthly basis? Engr ‘Dapo Olagunju: Connect with people and being genuinely eager to help them with what I have is the strategy that has worked and will always work for anyone who can be focused at helping others. Olowo Bolarinwa Benjamin : Practical demonstration? Engr ‘Dapo Olagunju: Everyone I meet are real people and I keep in mind what I have that seem useful to all and if the person happens to be someone who will understand what I share then I go ahead and present. Many people don’t get result due to over familiarity with friends but I do try not to be too much of a hester so that people can take me more serious when I am more serious than they are used to. Virtually all of us have our first 10 sign ups already in our address book all that’s remaining is to get serious and be business like. Then expand the address book to bring in more. Olowo Bolarinwa Benjamin : Nice one. Over familiarity at times may lead to loosing a prospect to signing up. After recruiting, they will say, develop yourself, so the question is this, network marketing industry, an industry for self development, what can you say to this? 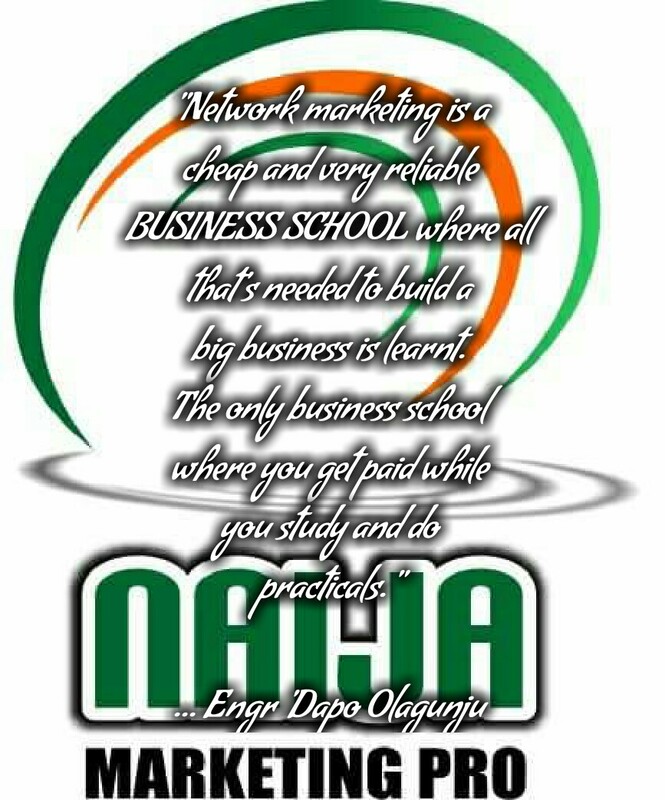 Engr ‘Dapo Olagunju: Network marketing is a cheap and very reliable BUSINESS SCHOOL where all that’s needed to build a big business is learnt. The only business school where you get paid while you study and do practicals. Olowo Bolarinwa Benjamin : So, network marketing industry can also be termed as a business school where you learn and earn at the same time. This is awesome. Top leaders in this industry categorically Eric Worre, has said, that as a network marketer, you are a consultant and not a salesman, can you tell us more about this statement, ‘consult, don’t sell’? Engr ‘Dapo Olagunju: Yea, I am in 100% agreement to that fact! We should have a problem we are using our business to solve with the consent of the one having the problem helping him to see that we don’t have the inky way but the best way…..In network marketing. Olowo Bolarinwa Benjamin : OK. Thanks, another one is to recruit but the main job is in the team building, how do one builds an indomitable team? Engr ‘Dapo Olagunju: I believe building a strong team is a function of building a well enlightened/educated team. 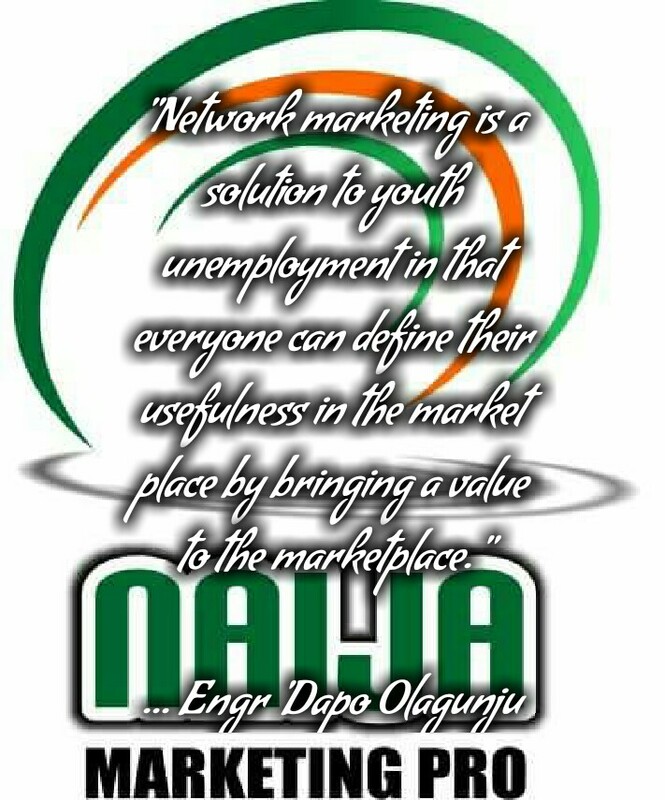 Engr ‘Dapo Olagunju: Network marketing is a solution to youth unemployment in that everyone can define their usefulness in the market place by bringing a value to the marketplace. Anyone who is not employed should simply deploy himself or herself in the study of available network marketing platforms by looking at various products and educational opportunities attached to each business opportunity before selection. Here is another challenge faced in the industry, people accept what is brought to them and they don’t have time to verify others on an unbiased basis. Network marketing is a business and should be taken seriously as a business but some look at the cost of buying their first package as the value of the business and they are very wrong. The value of a network is in the creativity of the person starting the business. I have a friend who built his $10,000 monthly income from his MLM business in 3 months. That’s his creativity because even the company has no such record since inception. Olowo Bolarinwa Benjamin : Let’s proceed. With the time spent with you since has been educational and enlightening, what do you like to do outside of work? Engr ‘Dapo Olagunju: I do a lot of research and study on personal finance and personal development generally. I spend almost all my time with my family since I mostly work from home. I also volunteer in my local church to assist the Pastor to serve the people of God. Olowo Bolarinwa Benjamin : Wow. Relationships freedom that’s it. It is also what I can call, spiritual freedom which is the ultimate freedom. With Network marketing, total freedom is guaranteed. What encouragement/words do you have for Naija Marketing Pro Community? Engr ‘Dapo Olagunju: This is a great job and won’t mind linking you up with some of the people I have dug up in my studies. Network marketing has a lot of silent millionaires and not all dollar six figure earners make noise in Nigeria. I pray God will take your platform to the top where it belongs where our youth will be able to use it for direction. Olowo Bolarinwa Benjamin : All of us at Naija Marketing Pro says thank you for creating a time out of your own busy scheduled to have this conversation with us today. We hope this will definitely impacts some youths and it will let them be aware that they can take full ownership of their lives because with network marketing, there’s a better way. It’s our wish to see you becoming a Naija Marketing Pro. because with network marketing, you can take full ownership of your life. Always follow our posts and strategies. But, be reminded, personal development doesn’t work but action. I love the above lines?? This’s great. Jion Oriflame cosmetics Sweden network marketing, we can build an empire with just #2990. I so much love the interview, network marketing is more of a teaching business than that of sales business!! What a word, thank you so much…. Good morning, i like network marketing, i even find myself into one of the online business. But have not been able to recrut anyone since i join them almos two years ago. All you need to do is to take your time to study our blogs and then start applying what you learnt!